H aving looked at a few wedding planning apps for Android and the reviews for each I decided to download an app simply called ‘Our Wedding’ to see if it would be a helpful planning resource. I love a paper organiser because I’m a note taker, there’s nothing better than writing lists and crossing things off. When I was looking for a venue I took a folder with me and made notes about my initial feelings and pros and cons of each venue. So, can an app really be as good an organiser? My first impression of the app was positive; the menu is clear, the options are easy to navigate and everything is intuitive to use. However a BIG downside is that there are loads of adverts – not something you expect to get with a wedding planning app. With four simple options of ‘To-Do’, ‘Guests’, ‘Budget’ and ‘Vendors’ you are able to manage your spending, keep track of your invoices, which guests have RSVP’d and what parts of the wedding they are attending, and what tasks you have left to complete. One of the most difficult parts of wedding planning is managing the budget. 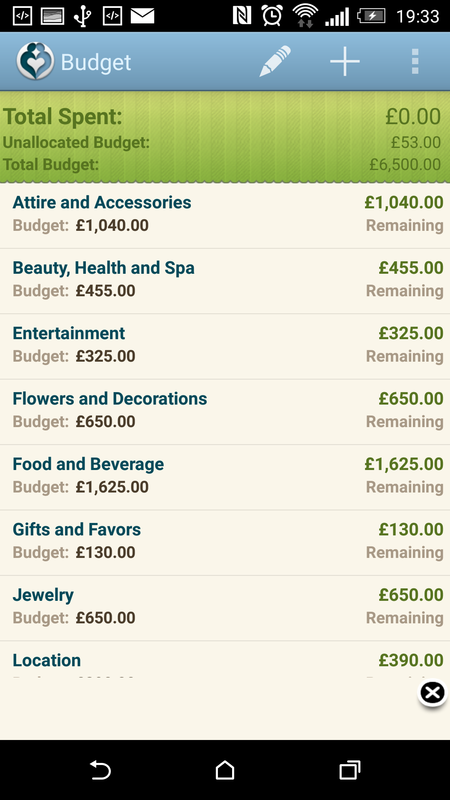 The app allows you to input your total wedding budget, which it then automatically allocates to pre-set costs. For those at the very start of planning, the cost allocation could help decide what areas of budget you need to cut back on so you can spend more on others. There were a few costs included in the standard list that do not apply to my wedding, such as transport. To delete an unnecessary cost from the list you simply click on it and press the bin icon. The budget previously allocated to this cost will now show as ‘un-allocated budget’. Imagine being at a wedding fayre where you see an entertainer you think would be perfect for your day, you don’t have to pull out a massive organiser or wait until later to access your spreadsheet to know if you can afford them or not, you simply load up the app and allocate some budget to a new cost category to see how it would affect your overall budget. At first the apps ‘Guest’ section doesn’t seem all that great. You can add guests, select the status of the guest (invite sent, will be attending and if they are full day or evening only, if they are a ring bearer, Best Man etc) along with their contact details – Not really the type of thing you benefit from having on your phone. I can see 1 benefit though. Ask anybody who has got married in the last 10 years and they’ll tell you trying to get RSVPs out of your guests will be one of your biggest stresses. So when you’re visiting or speaking to your guests and they say they’re coming you can just update the app to show them as attending. It’s just a shame it doesn’t have a way of filling in menu choices too. Out of the different sections for me the bit I use the most is the Budget section. It’s still 14 months until my big day, so I find myself looking at things, putting them in as a cost and seeing how it affects my budget. As far as a wedding planning app goes this one isn’t too bad for quick planning on the go. Although I don’t think an app can really beat a good old fashioned organiser.